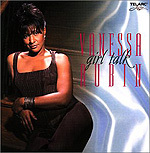 One of the best of a generation of female jazz singers who came of age in the late '80s and '90s, Vanessa Rubin does more to integrate popular music strains into mainstream jazz than any singer who comes readily to mind. Firmly in the jazz vein, Rubin nonetheless has been steeped in the popular music styles of the '50s-'70s. Most notably, rhythm and blues and soul permeate every note she sings. Interestingly, on her latest album, the non-jazz influences are most pronounced on the songs that are deepest in the jazz canon. Tracks like "One for My Baby (And One More for the Road)," "But Not For Me" and "Comes Love" absolutely drip with a fully ingrained soul sensibility. Yet on more pop-oriented songs like "Matchmaker Matchmaker" (from the musical "Fiddler on the Roof") and Stephen Sondheim's "Loving You," she is at her most firm grounding in straight-ahead jazz. Surrounded by a first-rank cast of musicians (Eric Alexander and Javon Jackson on reeds, Lewis Nash on drums, Cedar Walton on piano) and joined on two cuts by blues legend Etta James, Rubin's performance here is as satisfying as it is impressive  and is likely to find a place in the regular rotation of your CD player.